Jo Pavey will soon become Britain’s first female track athlete to compete at five Olympic Games and that was one of the reasons the inspirational 42-year-old was considered among the favourites for the role of Team GB flag bearer at tomorrow’s opening ceremony in Rio. That honour has been handed to tennis star Andy Murray, but the discussion did lead many fans to voice further support for Pavey on social media, highlighting her achievements and the impact the long-distance runner has had on the sport. The ever-gracious Pavey, who made her Olympic debut in Sydney in 2000 and is currently at a preparation camp in Belo Horizonte, is characteristically modest when this is mentioned to her. “Andy Murray is someone I greatly admire, he is absolutely amazing,” says the 2004 Olympic fifth-placer, who stormed further into the spotlight in 2014 when, aged 40, she won European 10,000m gold just 10 days after battling to a brilliant Commonwealth 5000m bronze. “Obviously he has won the Olympics, he has won Wimbledon twice and I can’t think of a better person. I think that’s brilliant. “It would be an honour for me to be mentioned in that light!” she adds on hearing that her name had been among those mentioned for the role. Pavey admits that she was “really up against it” this year. In each of her previous four Olympic Games experiences, the Exeter athlete had gained an automatic place on the GB team, but 2016 presented a series of challenges. 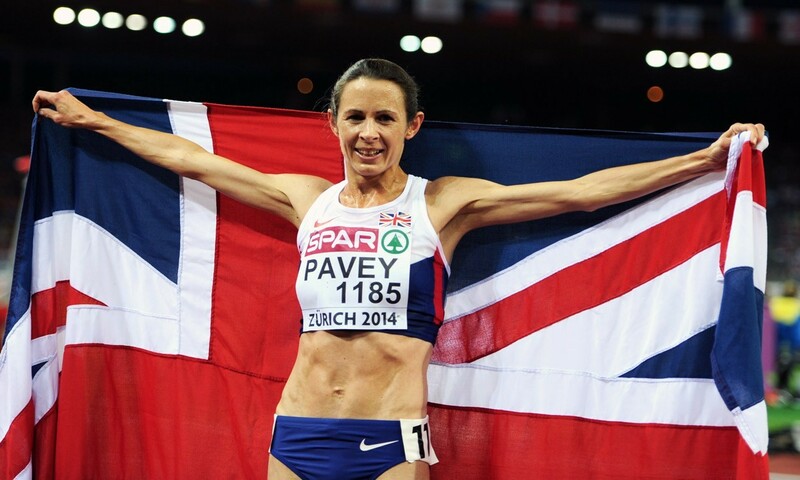 Illness hit her a few weeks before the British 10,000m trials and it took Pavey a while to build her way back. “I was surprised it took me so long to get my health right, it was weeks of knowing that my body didn’t feel right,” she says. “It was so frustrating because I knew that I had put the training in, if I could only feel right in myself, perhaps I could have a chance of trying to qualify but it just went on and on. That performance came during the defence of her European title in Amsterdam, where Pavey clocked 31:34.61 for fifth. “I just feel really thrilled to be going to a fifth Games,” Pavey says, before going on to highlight the achievements of other British five-time-plus Olympians, javelin thrower Tessa Sanderson, who competed at six Olympics, and race walker Chris Maddocks, who raced at five. Pavey contests the Olympic 10,000m during the first session of athletics action on August 12. On her Rio hopes, she adds: “I think as an athlete you should never put any limits on what might or might not happen in a race, you just absolutely go for it. I’m just preparing the best I possibly can and on the day I’ll just give it absolutely every ounce of energy I’ve got. “It will be tough, obviously it’s a tough field, but anything can happen – tactics can be not what you expected them to be and you’ve got to react to the situation.